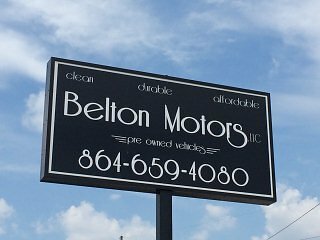 Belton Motors is a family owned dealership serving the Belton, SC area and would love to help you with your next vehicle purchase. Owner, Peter Kesting has been serving the Belton area for over 15 years. Every car we sell comes with a free comprehensive CARFAX vehicle history report. Most of our vehicles also come with a warranty. We also have a great referral program. You can earn $40 for every customer you send to us who makes a purchase. And, we buy vehicles! If you refer a customer who sells their vehicle to Belton Motors, you will receive a $40 referral fee! We will do our best so that you leave with a smile on your face and are totally satisfied with your purchase.